"Receiving a hand-written letter is becoming a rarity in today’s world of email, text messages and social media, but the experience remains one that is unique because it is so intimate. When I open a letter that is addressed to me, I hold evidence of the interior life of another person. When I compose and send a letter, I give something of myself that is much greater than the meaning of the words I have written. Loring M. Bailey, Jr. wrote prolifically throughout his experience of training and war. With diplomas from Pomfret School and Trinity College in hand, Ring found a passion in the written word. His letters represent the emergence of a new voice. A voice heard only briefly and from the most horrific of circumstances. Through the kindness and trust of Loring’s family and friends, I first read these letters in the spring of 2011 and began to adapt them for the stage. For the next two years, I tried to hear Loring’s voice and allow it to lead me toward a theatrical life. The play, 70lbs of Books*, was performed by students, faculty and staff of Pomfret School in May of 2013. Quite suddenly, everyone at the school knew Loring Bailey through the power of his own words. Though Calm Frenzy is the extraordinary legacy of one young soldier, his work honors the countless men and women who have stepped into harm’s way to keep us safe. This book is dedicated to all veterans, past, present and future. They all have stories to tell. *70 lbs of Books, a play based on the letters of Loring M. Bailey Jr., was written by Chip Lamb, Arts Chair and Theater Director at The Pomfret School, Pomfret, CT. The play premiered at the school in May 2013 as part of the 50th reunion of Bailey's graduating class. Loring M. Bailey Jr. graduated from Trinity College, Hartford Connecticut, in 1967. The recipient of writing awards in fiction, a graphic artist, and an ardent automobile enthusiast, Ring continued with graduate courses in English, and was a technical writer for the Electric Boat Division of General Dynamics Corporation. His love for automobiles was seen through pen and ink sketches, water colors, short stories on racing, a collection of plastic and metal die cast replicas, and an extensive library of volumes on development, history and design. With a perennial thirst for good writing, Ring was a vigorous reader, and a strong admirer of Ernest Hemingway. In the spring of 1968, under the threat of the draft, Ring enlisted in the Army with the option for Officers Candidate School. 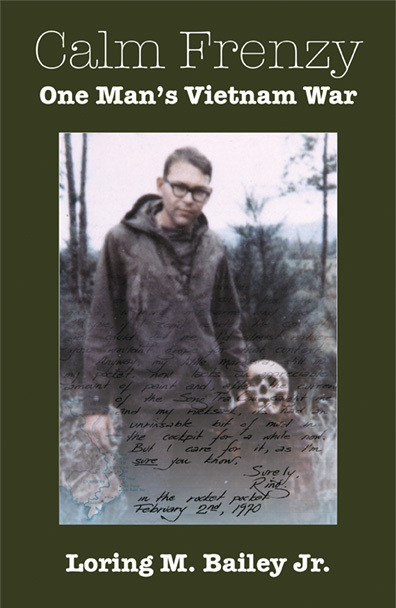 From his induction in June 1968 and Basic training in Fort Knox Kentucky, began a series of letters to his family, fiance, and friends that became his only dependable means of communication. With an Infantry assignment, basic training led to nine weeks of Advanced Infantry Training in the swamps of Fort Polk Louisiana, "Tigerland: The Home of Infantry Training for Viet Nam". While at Polk, arrangements were made through the mail for a Christmas wedding, and on December 23, 1968, Ring was married to Maris Carlson. Ring continued training with the Officers Candidate School at Fort Belvoir Virginia, where a recurrent knee infection kept him in and out of the base hospital. After six months at Belvoir, he was recycled out of the program and placed on a holdover status, where the final ten months of his Army career was mapped. This included a 39 day leave and nine months of combat infantry in Viet Nam. In early October 1969, Ring reached the war zone, was assigned to the Americal Division, and was stationed at Landing Zone Liz, a forward fire base that operated out of Chu Lai, RVN. Writing stations were established immediately, and the letters flowed regularly out of the jungle. In mid-November, Ring was assigned as the commanding officers' radio telephone operator, and shortly after that, promoted from private first class to specialist fourth. On the fifteenth of March 1970, while on Nui Chap Vung Mountain in the Quang Ngai province, Ring was fatally wounded from the detonation of a hidden anti-personnel device. He was posthumously awarded the Bronze Star Medal and the Purple Heart. This volume contains edited excerpts of his letters. They were written to his wife, parents and close friends. To his wife and parents he was often over protective, and the horrors of war were veiled and indirect. He wrote of his physical needs and desires, of the equipment he used, and always optimistically about the future. To friends David and Yvette Toohey, he wrote more directly of the overall military actions with histories and fictions that blended reality with the absurd and drew parallels to the home front. To his brother-in-law Rik, his letters shared an interest in good writing and a love for automobiles. Mr. & Mrs Loring M. Bailey Sr.
© Calm Frenzy. All rights reserved.